Dempsey L. "Buck" Moore, age 88, of Lorain, passed away Friday, May 25, 2018 at Mercy New Life Hospice, Lorain, following a lengthy illness. Born October 28, 1929 in Washington, Pennsylvania, he moved to Lorain in the late 1940's. 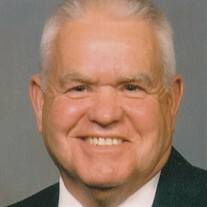 Dempsey worked as a brakeman for Norfolk Southern Railroad for 40 years, retiring in 1993. He was a member of the former Living Word Wesleyan Church in Elyria and attended First Baptist Church of Elyria. He was also a member of the Railroad Retirement Breakfast Club and enjoyed collecting railroad memorabilia and spending time with his great grandchildren. Surviving are his children, Floyd Martin of Wellington, Pam Cervone of Fort Wentworth, GA, and Carles "C.D." Moore of Warren, PA; 11 grandchildren and many great grandchildren; a brother, Edward of Pennsylvania; and sisters, Rose Faren of Nova, Grace Kiskadden, Anna Mull and Maybell Cross all of Pennsylvania. He was preceded in death by his wife of 49 years, Mildred (nee Grimm) Moore in 2001; parents, Thomas and Cora (nee Caldwell) Moore; brothers, Edgar, Harry "Zeke", and Thomas "Short"; and sisters, Mary Medlen, Dorothy Scott, Helen Main and Nancy Burgess. The family will receive friends on Saturday from 11:00 am until the time of services at 12:00 pm in the Dovin Funeral and Cremation Specialists, 2701 Elyria Avenue, Lorain. Rev. Patrick Odle, pastor of First Baptist Church will officiate.